Equipment: satellite TV; DVD; internet access Wi-Fi (payment, on order); washing machine; electric heating; underfloor heating (only in the bathroom/s); storage room in the house. detached house, 4 - 6 people, 4 room/s, 3 bedroom/s, 1 bathroom/s, approx. 115 m², 2 floor/s. Furnishing: holiday standard, rustic. partially low door height (1.85 m), stairs (steep). Bedroom 2: (floor 1, limited height): 2 x single bed. Bedroom 3: (floor 1, limited height): 2 x single bed. Important information: maximum occupancy: 4 adults and 2 child(ren). Kitchen: Kitchen/ cooking equipment: 4 ceramic hobs, oven, microwave oven, refrigerator, coffee machine, freezer box approx. 300 litre. separate (ground floor). Access/parking: Access to the house via footpath approx. 30 m. parking near the house approx. 30 m.
Bathing jetty/bathing: landing jetty (shared use) in approx. 100 m, bathing jetty (shared use) in approx. 100 m.
Estate: (private use): open plot, in a hillside, natural surroundings. Fishing: fish-processing table outdoors. good fishing possibilities, certified fishing house (up to 20 kg fish). Information on the boat(s): Motor boat (15.0 hp; 17.0 foot; approx. 100 m distant; payment, on order). Motor boat (payment, request on-site). 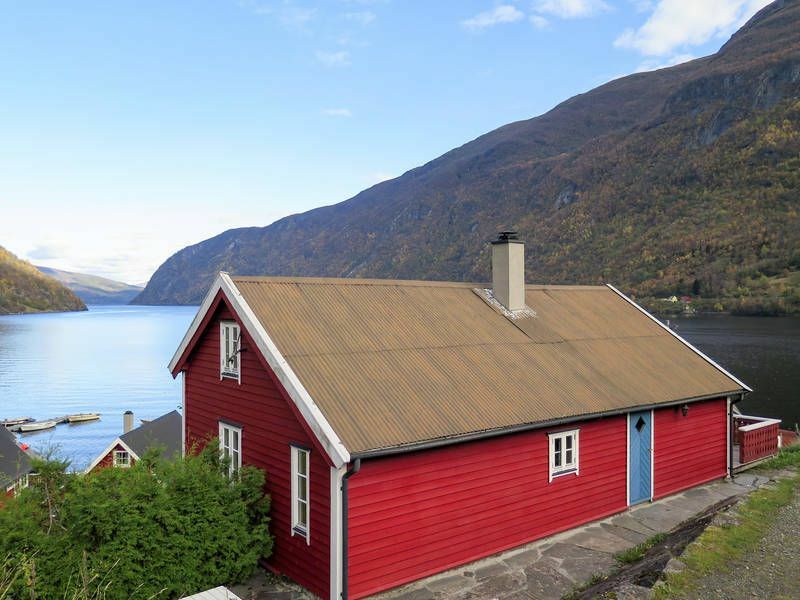 Situation: in the hamlet Arnafjord, fjord view, view of Arnafjord. Arrival: Airport Bergen Flesland in approx. 194 km. Ferry port Bergen in approx. 195 km. Beach/waters: Fjord in approx. 40 m.
Bus stop: Bus stop in approx. 100 m (Nese Snuplass). Next village/town: Center Framfjord in approx. 8 km. Sogndal in approx. 76 km. Voss in approx. 96 km. Shopping: Next shopping possibility (Framfjord) in approx. 8 km. Next supermarket (Vik) in approx. 27 km.